Aluminum City is Ramona, California's trusted source for long-lasting, low-maintenance patio covers, window awnings, door hoods, carports, and California rooms. In operation since 1963, we've installed these shade systems on thousands of residences and businesses throughout Southern California. 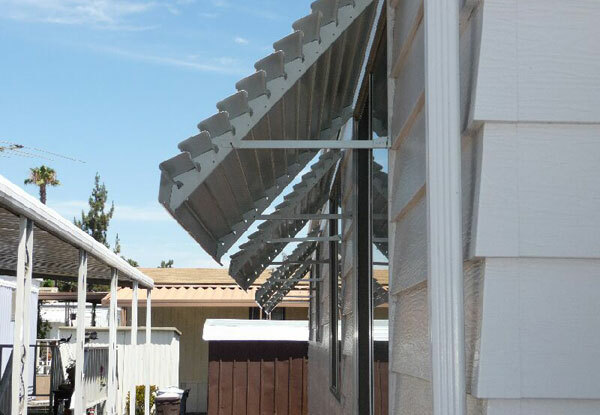 By providing our high-quality patio covers, awnings, and more with superior customer service at some of the lowest rates in San Diego County, the name Aluminum City has become synonymous with value. Not surprisingly, we receive more than a third of our work through returning clients and from the referrals of past customers; maintain an A+ rating from the Better Business Bureau; and have thousands of satisfied clients. Our locally owned company's goal is to provide each of our Ramona clients with personalized, expert service. Because our owners design, sell, and install all of our patio cover products themselves (we don't outsource our work), we are able to offer very cost-efficient pricing that is lower than the vast majority of our competitors. Each sale is personally made by one of Aluminum City's owners, who each have over thirty years of experience in the patio cover and awnings industry. Whether you need a storefront awning, door canopy, carport, or additional coverage for an outdoor entertaining space, we have the material and skills to build a product that is durable, attractive, and functional. Our products provide protection from the sun, and add beauty and value to businesses and homes. Call licensed, bonded, and insured Aluminum City today. We provide free on-site project estimates and consultations for our Ramona customers, and serve the entire San Diego and Southern California area. Our hours are from 7 a.m. to 10 p.m., and we're open every day of the week. We have an average project turnaround time of 2-3 weeks. Our company is an authorized dealer for Four Seasons Building Products. They are the only manufacturer that, prior to baking on the enamel paint, makes sure to prepare, prime, and bake their aluminum materials. This results in patio covers of superior quality for your business or home in Ramona, California. Four Seasons Building Products also builds their patio covers with exceptionally strong, structural aluminum for added durability. Four Seasons Building Products offers patio covers, patio room enclosures, pergolas, and carports, all backed by a Lifetime Limited Warranty. 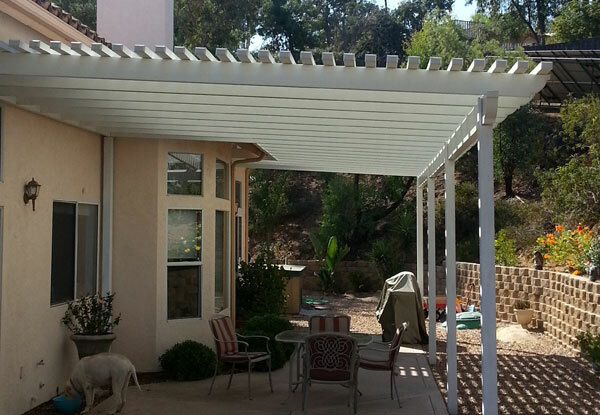 Aluminum City builds high-quality patio covers for Ramona businesses and homes. We provide our clients with a choice of solid top, pergola/lattice top, and combination top coverings, and help advise you on the best option depending on your aesthetic preferences and sun protection needs. The aluminum material of our patio covers helps to dissipate heat away from your Ramona property, which results in cooler temperatures directly below your patio cover as well as within your home or business. Our solid top patio covers all come with built-in gutters to divert away water and ensure proper drainage. Aluminum patio covers also means you no longer have to worry about maintenance, flaking, rusting, rotting, or damage from termites. 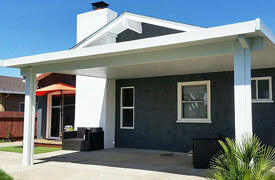 To personalize your patio cover in Ramona, pick between a smooth or wood grain finish; a choice of six different colors; various column thicknesses (standard, square Roman, and round Roman); four different end cuts (bevel, miter, corbel, and scalloped); and a variety of accessories, such as lighting and ceiling fans. 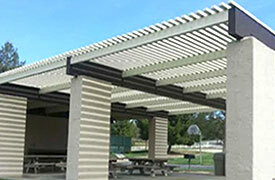 Our lattice patio covers are a popular building addition for many of our clients in Ramona, California. Available as a full lattice or a combination (partially lattice and partially solid), our patio covers can be designed to help you achieve the precise amount of coverage you are looking for. Lattice patio covers can also be freestanding to create a welcoming pergola structure. 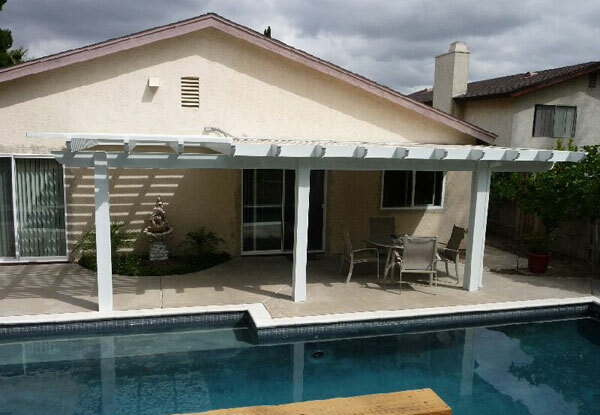 We've designed, built, and installed patio covers for thousands of residential and commercial customers throughout Southern California. Customers get to choose the color, cut, column thickness, and finish of their covered patio, which they can coordinate to match the outdoor decor of their Ramona home or business. 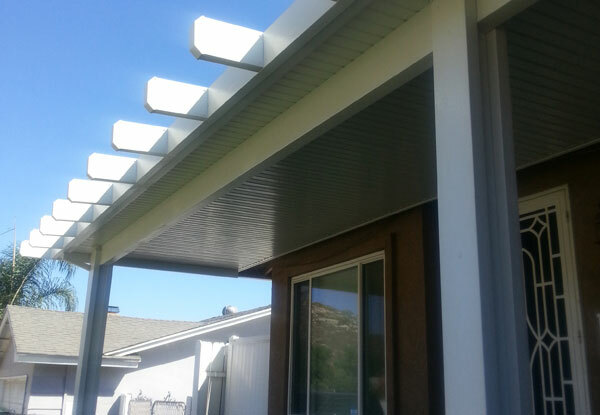 At Aluminum City, we sell and install insulated patio covers in Ramona. Filled with polystyrene foam that is 3-4 inches thick, the insulated patio cover is a sturdy and energy-efficient product. This cover can be built alone or as part of a California room enclosure. For the latter, we construct insulated walls along with an insulated top. The room is fitted with low-E windows, your choice of door (regular, glass, French, or sliding), and gutters and spouts to divert and drain water. Our licensed and bonded electrician installs electrical raceways if you are interested in ceiling fans and lights. 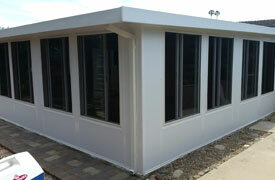 Aluminum City always builds our covered patios to Ramona city code. 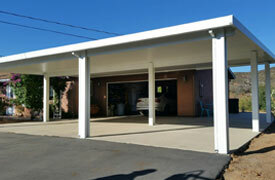 We've built many freestanding and attached carports for residential and commercial customers in Ramona over the years. These carports range greatly in appearance and size, as they can be designed to protect a personal vehicle on the side of a home, installed on a lot that can accommodate over 100 cars on any given day, or built on top of a building to shield valuable electrical equipment. 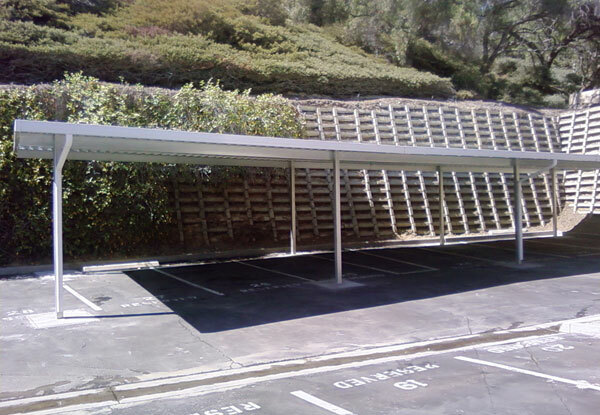 We build our carports with a solid top, which helps to protect your property from the sun and elements. To help you determine your carport needs in Ramona, we'll first visit you on site in Ramona and then put together a design and quote. Aluminum City has built custom-made window awnings and door covers for both commercial and residential clients throughout San Diego. Our projects have included local office buildings, police departments, Navy bases, border patrol sites, single-family homes, and restaurants. Because they are cost-effective and low-maintenance, our window awnings are a practical alternative to iron or fabric awnings. Our window and door covers are constructed from solid aluminum panels slatted at a 45 degree angle. They are available in 20 different colors and built to last for a minimum of forty years. Our materials are all crafted to be a precise and perfect fit for your Ramona business or home. We had a carport and large patio installed. From the moment we started discussing our interests, Red understood what we wanted and how we wanted the finished product to look. Aluminum City Company is very professional. The communication regarding start dates, the time of day the would start and what to expect. We are thrilled with the finished product. We would recommend anyone to contact Aluminum City for an estimate, you won't be sorry you hired them. 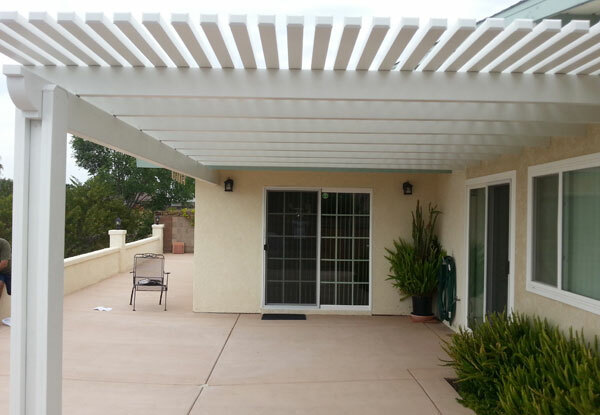 This patio cover in Ramona, CA includes an embossed wood grain finish, beam, and wrapped posts. This is an all aluminum lattice cover and will last a lifetime.